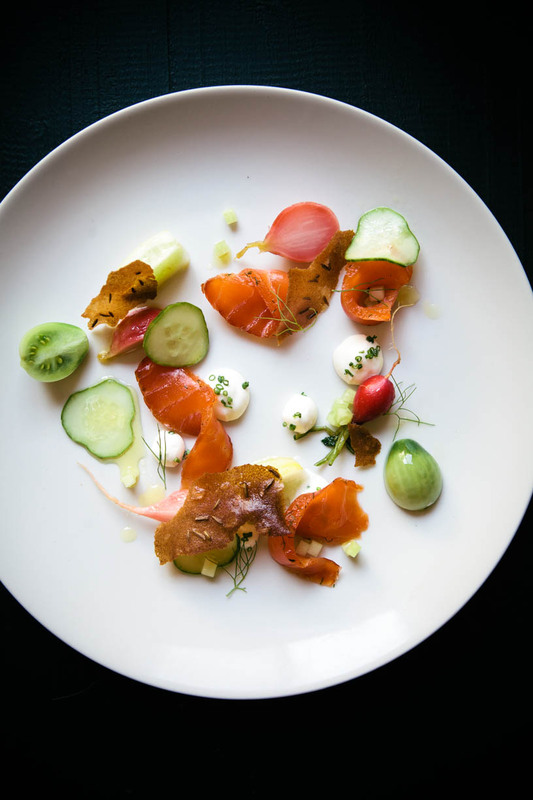 Cured Salmon — always with butter. On Sunday at nearly 4am we woke to the entire house shaking. It was very strong and completely disorientating to wake up to. Adam was saying 'what is this?!?!'. After we both realized it was an earthquake, I just kept saying 'I don't like this'. It seemed to last for so long and it was much stronger than I had ever felt. I have lived in the bay area for nearly all my life so earthquakes were just a thing that happened. Not a big deal. This was a lot different. Violent shaking. After a few minutes he got a text from his friend/manager of the restaurant they both work at. Just making sure we were ok. Then he was going to go check out the restaurant since he lives close by. We are about 30 minutes away and nothing in our house got damaged. A few minutes later there was a call saying that the restaurant and pretty much everywhere else in Napa was trashed. Wine bottles, glasses plates, everything was in pieces on the ground. Luckily being in a new building their was no structure damage. The building around the street was crumbling down, others had their windows shattered. The streets were just covered in glass. So at 4 in the morning we drove down to check on the restaurant. People were everywhere. The rest of the day was spent cleaning up and baking brownies to pass out. Monday too was spent still organizing and cleaning up. They were one of the lucky restaurants in downtown. Many are shut down for a while to still clean while others the building has been deemed unsafe to where it won't be back. That has been my past two days. This recipe is one that Adam had made while testing for the restaurant. Since I don't eat fish I can't really tell you too much about it. I did enjoy snacking on the pickled radishes though. It seemed like a winner in his book though because it is now on the menu at the restaurant. Finely chop fennel frowns. Mince the garlic. 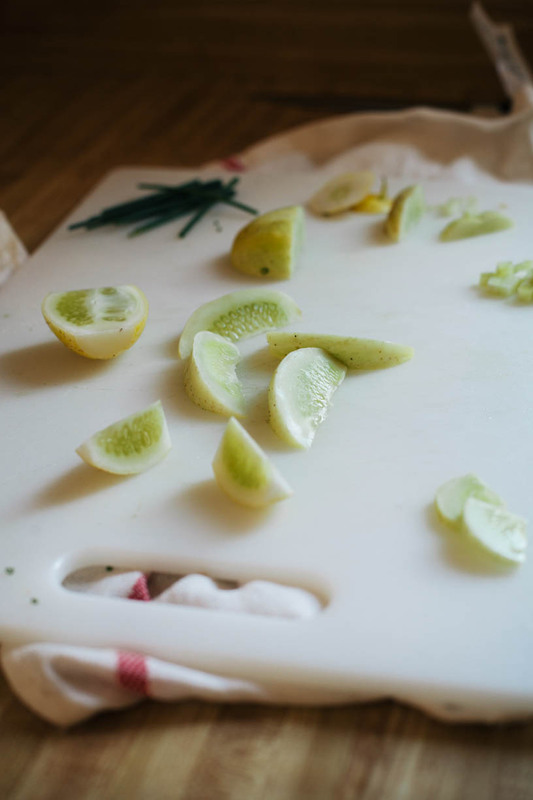 Mix the lemon, orange, garlic, fennel with the pernod. Then mix in the salt and sugar. On a pice of plastic wrap, put half of the cure down in an even layer. Place salmon on top then pack the rest of the cure on top of the salmon, making sure to cover all. Wrap tightly in plastic wrap. Fridge for 24 hours, flipping after 12. Bring all ingredients to a boil, except for the radishes. Add in radishes and allow to return to a boil before removing heat to cool at room temperature. Then chill for 24 hours before serving. Whisk flours, sugar and salt. Add in egg white(s) and whisk until smooth. Add in butter and whisk until smooth and creamy. Spread a small amount onto a silpat lined baking sheet into a thin even layer. Sprinkle with seeds and maldon. Bake until golden brown. Let cool. Toss all the vegetables in the pickling liquid from the pickled radishes. Arrange on plate. Quenelle the creme fraiche or just put a dollop on, then top with chives. Add salmon and radishes, then drizzle olive oil on plate.